Sky Mile Tower is a conceptual design for a towering one mile-high building in Tokyo. Image courtesy of Kohn Pedersen Fox. The tower is part of Next Tokyo, a vision for a city on a man-made archipelago. Image courtesy of Kohn Pedersen Fox. The Next Tokyo will comprise hexagonal rings that will reduce the impact of waves in a low-lying area. Image courtesy of Kohn Pedersen Fox. The tower will house 55,000 people and is designed with a number of sustainable features. Image courtesy of Kohn Pedersen Fox. The hexagonal rings will be the hub of development, and include water storage and pedestrian routes. Image courtesy of Kohn Pedersen Fox. The futuristic eco-district and the mile-high tower is the vision of design architect Kohn Pedersen Fox. Image courtesy of Kohn Pedersen Fox. Sky Mile Tower is a conceptual design for a soaring structure that has been envisioned by architects Kohn Pedersen Fox Associate in their vision of Tokyo, Japan, in 2045. The mile-high tower is planned as part of a resurgent megacity named Next Tokyo, which features a high-density eco-district consisting of resilient infrastructure that enables it to adapt to climate changes. The Next Tokyo concept has been developed for research and development purposes to propose an urban area for the low-lying coastal city faced with rising sea levels and increased typhoon risks. 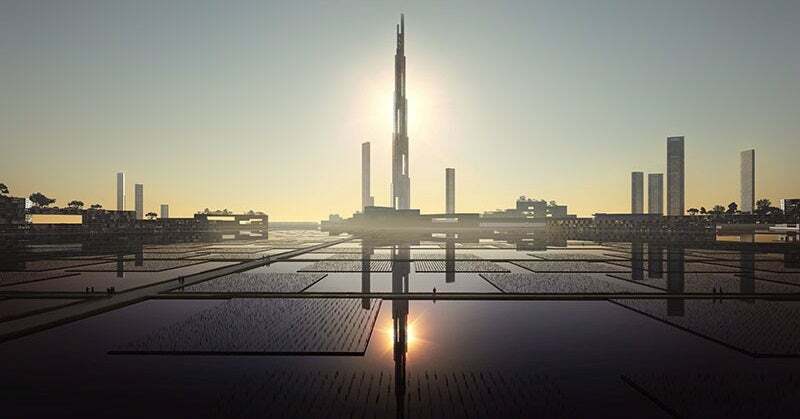 The tower and the accompanying city will be located on a reclaimed land in Tokyo Bay and will feature a design based on sustainability, efficiency, reliability, robustness and safety as key elements. Featuring a towering network of residential dwellings, the skyscraper will be home to approximately 500,000 residents, and include basic amenities, as well as the latest technology. The tower exhibits a tapered form with vertical slots along its length that will serve as open-air sky decks, allowing the wind to flow through. It is designed to fit into a hexagonally shaped space and will consist of multiple sets of three interlinked building legs. The set of building legs are placed to overlap with each other in a sequenced format, creating sky lobbies at the point of overlap, after every 320m. Each set of the building legs will have between 60 and 90 floors. The structure of the tower has been designed to bear the impact of the wind load. The inner side of the buildings walls will be mega-braced, while the sides will have concrete shear walls. The two sets of building legs are connected by large steel trusses at the overlapping common floors. The steel structure is set in the form of plane frames that are bound by the concrete finishing. Small columns present at the perimeter will support the concrete floor framing and are further supported on belt trusses at intervals of 30 or 40 storeys, transferring the load to the concrete shear walls. The skyscraper will feature an articulated facade that will enable cloud harvesting as a source of water. Water will be collected and stored at different levels and distributed using gravity, eliminating the need to pump it from the ground to the various levels, which would be expensive and time-consuming. The height of the super-tall structure will help to reduce the heating load at minimal energy and financial cost by utilising the cool air present at higher floors. Wastewater will be recycled mechanically and also through cloud harvesting and rainwater catchment systems. "The mile-high tower is planned as part of a resurgent megacity named Next Tokyo, which features a high-density eco-district consisting of resilient infrastructure that enables it to adapt to climate changes." An anaerobic digester will be available to manage the organic waste and generate natural gas in the process to run tri-generation plants. The residential tower will have a built-up area of 1.375 million square metres and a density of approximately 25m² a person. It will feature multi-level sky lobbies, shared public amenities, shopping, restaurants, hotels, gyms, libraries and clinics. New and advanced technology will also be integrated in the tower, such as ThyssenKrupp’s MULTI magnetic-levitation elevator technology. Next Tokyo will comprise a district traversing 12.5km² on a man-made archipelago. It will be situated in the Tokyo Bay between coastal communities of Kawasaki and Kisarazu. The development has been conceived to protect the low-elevation areas of the city against the perils of typhoons, earthquakes and floods. It has been designed to include infrastructural elements such as faceted breakwater bars and operable floodgates to create flood barriers and provide defence against severe storms. The eco-district will also include hexagonal rings ranging from 150m to 1,500m in width that will reduce the impact of the waves allowing ships to pass through. Rings of varying sizes will fulfil different purposes. The smallest rings will be used to accommodate high-density development, whereas the medium rings will provide water storage. The hexagonal rings present at the perimeter will include low-density development, open spaces and pedestrian routes. The plan will be transit-oriented with tunnels, regional lines and a new vacuum-tube transportation system based on technology currently being developed by Elon Musk. Leslie E Robertson Associates is the structural engineer, RWDI Consulting Engineers is the wind engineer, ThyssenKrupp is the vertical transport consultant and M.I.R. and 3DFocus have worked on the renderings.